The Pike Place Market sits in the center of downtown Seattle and at the center of the Seattle food scene. With its famous seafood and locally grown produce, it is seven acres of wonderful ingredients and inspiration for the home cook. 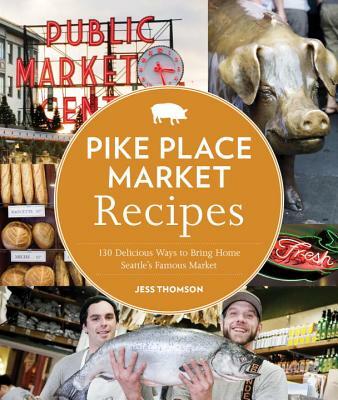 Cookbook author Jess Thomson has prowled the Market's stalls, shops, restaurants, and purveyors to assemble 80 wonderful recipes that express all of the flavors of the Pike Place Market. Included here are Le Pichet's Salade Verte, Etta's Mini Dungeness Crab Cakes by Tom Douglas, and the Pink Door's Linguine alla Vongole. The author has also created recipes that are inspired by ingredients found at the market, such as Spanish Chickpea and Chorizo Stew (with Uli's Sausage) and a MarketSpice Tea Cake. The author is so well versed in the market that her cookbook can also serve as a guide to the specialty shops and off-the-beaten path purveyors and cafes. With gorgeous images by photographer Clare Barboza of prepared recipes, dazzling ingredients, and scenes of the Pike Place Market, this is the ultimate Seattle cookbook. Jess Thomson is a Seattle-based freelance writer and cookbook author. Her work appears in publications such as Sunset, Cooking Light, Food & Wine, Edible Seattle, and Seattle Metropolitan magazines. She is a contributor at Leite's Culinaria, where her work was chosen for inclusion in Best Food Writing 2008 and 2010. She was also a finalist for a Bert Greene Award for Food Journalism in 2009. Jess, a graduate of Middlebury College and The Cambridge School of Culinary Arts, is the author of the food blog Hogwash, where she pairs food and life. She is also author of Top Pot Hand-Forged Doughnuts. Find out more at jessthomson.wordpress.com. The author lives in Seattle, WA. ...a wonderful rush of a book, filled with photographs of that dazzling mundane place... Jess gathered ingredients and recipes from nearly every purveyor in the place and turned those random scribblings into something great. "The Pike Place Market inspires good eating" reads the back cover. That was certainly true in this house. Danny and I flipped through the book and wanted to make nearly everything — wild mushroom tagliatelle! Spanish chickpea and chorizo stew! deviled duck eggs with green olives, smoked paprika, and fried capers! ...an excellent collection of recipes and stories from Seattle’s public market. I laughed out loud so many times while reading some of the really great anecdotes in the book. I give it two thumbs up! Whole Wheat Cinnamon Pull-Apart Bread? Bliss, and perfect with a cup of Market Spice tea (the original flavor, if you have to ask). The apple clafouti—what she calls the French Apple Custard Cake—is another bit of bliss, combining the best of the produce smells with the best of the buttery bakeries. For savory things, the Spicy Marinated Feta is lovely, redolent of all the market’s garlicky, spicy, pickled delights. ...reading and cooking with Jess's book is as close as I've ever come to duplicating a physical walk through the market without actually being there. Seattle writer Jess Thomson navigates the wild wonders of our world-famous Market via this go-to guide, which includes recipes for fresh offerings at market stalls as well as specialties by Seattle restaurant royalty. Learn the secret to Le Pichet’s salade verte, the pulled-pork sandwich at Matt’s in the Market and Fran’s Gold Bar brownies from Fran’s Chocolates. The cookbook has a good balance of simple recipes (including some particularly drool-worthy sopaipillas, fresh tortillas fried and topped with chipotle, cinnamon, and cumin) and more complex, fancy dinner party recipes (like a clam, mussel, and white bean paella). In the book, the vendors’ hints are successfully combined with Thomson’s food wisdom... With Pike Place Recipes, Thomson invites readers into the market as more than overwhelmed tourists or jaded locals—instead we arrive as excited home chefs and members of an ever-growing food community. Seattle’s iconic Pike Place Market is teeming with inspiration for delicious dishes, and likewise is home to many of our city’s most beloved shops and restaurants. Thomson has collected into one volume the best of the best to be had at the Market, such as Market Spice Tea Cake, Downtown Duck Salad from the Pear Delicatessen, and Marche’s Mussels with Pernod Cream. As if that isn’t tasty enough, she also gives us a plethora of menu suggestions, handy hints and tips, and a listing of shops and restaurants featured in the book. She did a terrific job of fleshing out this collection of shops and stores and stalls in her book, Pike Place Market Recipes: 130 Delicious Ways to Bring Home Seattle's Famous Market, beautifully photographed by Clare Barboza... Brilliant! Pike Place Market Recipes is more than a cookbook, flipping through its pages is like taking a tour through the variety and delight of Seattle's famous public market... The result is a book that captures the importance of place to a market like Pike Place. The place where things come from, but also the place that is the market itself. A historic landmark, a public gathering place, an anchor for a city. The recipes in Jess' book are simple in design and execution but full of complex flavors -- and right there is some Pike Place Market Magic at work. What I love even more than the recipes is that she seems to have captured the "soul of Seattle" between the pages of a book - no easy feat, that, and one that will help locals and tourists, alike, celebrate our market for what I hope is a hundred more years. The book is well worth a look even if you're not from Seattle...it's full of fantastic recipes, and wonderful stories about the famed and storied market. I couldn’t imagine a more perfect gift for a newcomer to the Seattle area than this book. It’s part guidebook, part cookbook, part tale of food-lover in paradise. What you need to know about Jess comes through in everything she does. She pours her heart and soul into her writing. In this book, she basically connects you with the souls of the market and gets their recipes. But that’s not it, she also gives you tips on what to do with foods you can find like her 10 way lists where she gives you 10 inspirational things to do with ingredients. This book is jam-packed with recipes and beautiful photos that highlight the beauty of the market. This is such a nice gift for someone who likes to cook.